ALBEMARLE COUNTY, Va. (WVIR) - Investigators in central Virginia are putting pressure on Gov. Terry McAuliffe to pardon a former University of Virginia student convicted of killing his girlfriend's parents more than 30 years ago. They argue new expert examinations of DNA evidence prove his innocence. The Albemarle County Sheriff’s Office and a former Charlottesville police detective sent letters to the governor this month describing their review of this double murder. 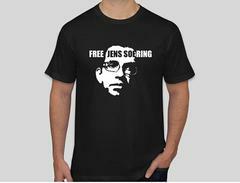 They want him to pardon Jens Soering and force investigators in Bedford to reopen the case. “This is an injustice,” Sheriff Chip Harding said. Stacks of crime scene photos, police reports, and trial transcripts lead Harding to one conclusion in the double-murder conviction of Soering. “The standard in America is supposed to be, convict you beyond a reasonable doubt. There's way beyond reasonable doubt in this case. This case isn't even close,” Harding said. Harding has created a war-room of sorts, where he's spent hundreds of hours reviewing the 1985 murders of Derek and Nancy Haysom. A jury convicted Soering of killing his girlfriend's parents in their Bedford County home. “You couldn't convict him today,” Harding said. At a press conference Wednesday, Sept. 27, Harding and former Charlottesville police detective Richard Hudson laid out their case to prove Soering's innocence. “I do not believe, based on all the work I did on this case and all the discussions and conversations and reports we've reviewed and worked with, that Jens Soering participated in the homicide of Derek and Nancy Haysom,” Hudson said. The prosecutor, who's now a circuit court judge in Bedford County, relied on blood found on a door handle matching Soering's blood type. Fast forward to now, and two DNA experts agree that blood and other blood found in the Haysom's home comes from two unknown men. 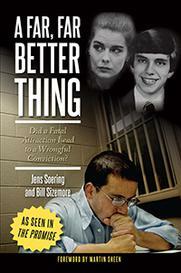 “Does Jens Soering DNA profile match any of those? They absolutely do not,” Thomas McClintock, forensic DNA specialist, said. “They're not Derek Haysom, and they're not Jens Soering. That's irrefutable. The DNA's not wrong,” Hudson said. That's why this team is urging McAuliffe to release Soering from his double life sentences and force Bedford County to re-open the investigation into the killings. “Here we are, 31, 32 years later, he's still locked up and nobody's listening,” Hudson said. “If you've potentially got two more people out there who participated, let's reopen the case and get this stuff looked at,” Harding said. Soering's attorney tells me the now 51-year-old is "thrilled" that these law enforcement officers believe he's innocent. The Governor's Office says Soering's petition for pardon is under review and an announcement will be made when it's complete.